To cleanse your aura with energy healing can impact massively on your physical well being. The three facets of our being are all intrinsically linked. Disease of our physical shell is a direct manifestation of a dis-ease of our spiritual life. With our aura acting like a rainbow gateway from the spiritual realm, the purity attracts all sorts of energetic gunk from our physical plane. Taking a few minutes on focused energy healing to cleanse your aura, allows inspiration and divine energy to flow far more freely. Meditation and visualization are perfect tools to cleanse your aura. The first step though is to understand what the aura is and what it does. Imagine being on an escalator and someone comes on the step right behind. You do not see this person, but instinctively you take another step up. Why? Because you felt that this person stepped into your personal space, and this energy field is your aura. Everyone has one, and it emanates anything up to 30cm from the body. It has 7 layers, but often only three or four colors are discernible. The aura acts as a barometer for health and emotions. When we are bright and vibrant, our aura glows. When we are less sparkly, our aura becomes dull and muted, which will manifest in showing different colors of the aura. In the same way, if we are not able to accept changes, we get “blocked”. Energy ceases to flow easily and we become ill; a better term is dis-eased. The key to avoid diseases or any other discomfort, is to cleanse your aura of these blockages, and to close any rips or tears too which may be leaking energy. Learning to do aura energy healing is simple. Sit or lie down in a quiet place where you can relax. Close your eyes and concentrate on breathing. Inhale for 8 seconds – hold your breath for 8 seconds – exhale for 8 seconds – and stay empty for 8 seconds. Then do the whole process again until you feel completely relaxed. You may find it easier to hold for 4 seconds at the beginning. This is fine. It is the focus which is important rather than the cycle. Now the energy healing itself. Picture a fountain of pure golden light coming out of the top of your head and flowing down your back to your feet. Let the light come round your feet and up the front of the body back to your head. Let it flow round and round six times. Then direct the light to travel from your head to your feet, but this time around the side of your body six times. You are aiming to encase your body – so visualize your body inside a golden egg of energy healing and protection. Now imagine beautiful sparkling golden rain pouring down over your egg. Let the energy cleanse you aura of all impurities. Allow yourself to “see” where there are weaknesses, grime, pollution, or just areas of depleted energy. Concentrate on areas where you may have niggles, aches or pains in your physical body. Cleanse the aura thoroughly and fill it with healing energy in these areas. Let the rain wash all the rubbish away to leave it perfectly clean and bright. You may find it useful to boost your energy with chakra healing too, as the two are inextricably linked. The important thing though is to cleanse your aura. 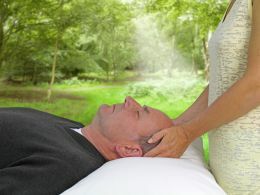 Used regularly energy healing can completely overhaul your health.